This workshop will focus on the work and life of Larry Eigner as a map to expand one’s own poetry and vision of the world. While he is most often associated with the Black Mountain College poets, Eigner, who had severe cerebral palsy, has also been read as an important influence on disability poetics, as well as eco-poetics and the language poets. His work is formally and syntactically marked by the breath-based patterns described in Charles Olson’s “Projective Verse,” and his poems also reflect William Carlos Williams’ “no idea but in things.” As such, the workshop will examine how Eigner’s poems fit into these categories and how we, as poets, can use his work as a jumping off point to expand our own. We will be generating new writing throughout the workshop, and our meetings will include critical discussion around readings, as well as their connections to contemporary activist movements. 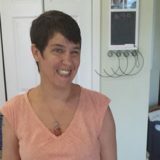 Jennifer Bartlett is the author of four books of poetry and co-editor of Beauty is a Verb: The New Poetry of Disability. She has been researching and writing a biography on Larry Eigner for the past seven years.